Tired of wondering if the meats you are cooking have reached perfection and optimum, food-safe temperatures? The beat meat thermometer can take the guessing game out of backyard grilling and stovetop cooking. But with an endless array of options on the market, each with its own unique set of features, which one is the best meat thermometer for your household? Our guide can help you sort through the options and pick the best meat thermometer. 1. Why Is A Meat Thermometer Important? A meat thermometer is the only surefire way to determine that meats have been cooked to a temperature that kills off harmful bacteria that could cause illness. The USDA has published guidelines about the minimum internal temperatures meats should be cooked to, and a thermometer is the best way to make sure those temperatures have been met. 2. What Should I Look For When Shopping For A Meat Thermometer? The best meat thermometers are accurate and take temperature readings quickly. If you will be using the thermometer for a variety of cooking, including everything from making candy to grilling steaks, be sure to purchase a thermometer equipped to handle a wide temperature range. When shopping for a thermometer, also think about how easy the product will be for you to use. It the thermometer designed to be easily held and stored? Is the display screen formatted in a way that is easy for you to read? 3. What Kind Of Probe Should I Look For? The best meat thermometers have longer probes, because the longer the probe, the deeper into your meats the thermometer can reach. Purchasing a thermometer that has a protective sheath for the probe can help ensure that your thermometer lasts. 4. What Special Features Are Helpful? The best meat thermometers come with a wide range of additional features, some of which can be quite helpful. It can be convenient, for example, to have a thermometer that is waterproof. Auto shut-off options can be useful regarding preserving the thermometer's battery life. And enhanced displays that are backlit and extra large for easy reading can make using the thermometer easier. 5. 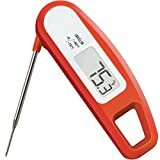 Does My Cooking Style Impact The Type Of Thermometer I Need? Yes. If you tend to stay in the kitchen or by the grill and closely monitor the food you are cooking, then an instant-read thermometer may be all that you need. If you tend to multi-task, visit with friends, or otherwise stray from the oven or grill, it might be wise to consider a leave-in thermometer that sounds an alarm when your meat has reached the desired temperature. Some models even sound alarms if the grill falls out of the optimum temperature range you've set. When evaluating the best meat thermometers, we took into consideration a wide variety of factors, including the accuracy of the product and the speed at which it determined temperatures. We also looked at extra features that can make meat thermometers easier to use, like waterproof casing, timers, and built-in magnets that allow you to affix the thermometer to a grill or kitchen appliance while it is in use. The best meat thermometers range in price from $10 to $50. More expensive thermometers have extra features like dual probes, display screens that are large and easy to read, and built-in timers and alarms. 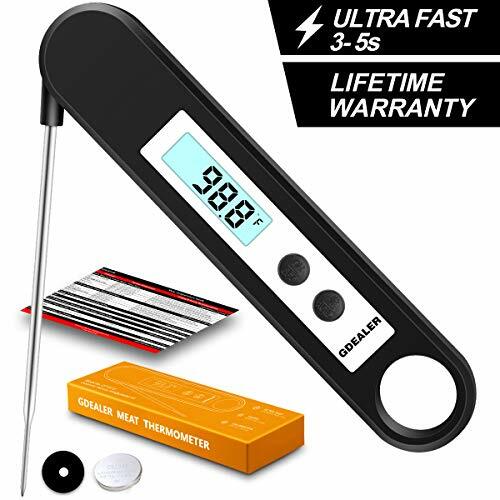 The GDealer Instant Read Thermometer has a wide temperature range of -58 degrees Fahrenheit to 572 degrees Fahrenheit, making it easy to use with a wide range of foods, including meats, candy, and brewing beer. The thermometer, which can switch between Fahrenheit and Celsius readings, reads meat temperatures within 6 seconds and liquids within 20 seconds. It pinpoints temperatures within one degree of accuracy. 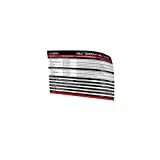 A temperature chart on the side allows cooks to reference optimal temperature ranges for their favorite meats. Other features include a built-in magnet, waterproof casing, and a foldable probe for easy storage. This thermometer comes with a lifetime guaranty. The Instant Read Meat Thermometer has a backlit LCD display that makes it easy to quickly read temperatures. The thermometer has a range of -58 degrees Fahrenheit to 572 degrees Fahrenheit. Capable of reading temperatures within 2 seconds, this thermometer can pinpoint temperatures within one degree of accuracy. A retractable probe makes this thermometer easy to store. This thermometer comes with batteries, a temperature chart, and an eCookbook. Other features include auto shut-off, a built-in magnet, and waterproof casing. This thermometer comes with a lifetime warranty. The Taylor Commercial cooking thermometer has a bold, nearly one-inch digital display that can be easily seen from any angle. This thermometer has a temperature range of -40 degrees Fahrenheit to 450 degrees Fahrenheit. It can take readings in either Fahrenheit or Celsius. This thermometer comes with a one-year limited warranty. 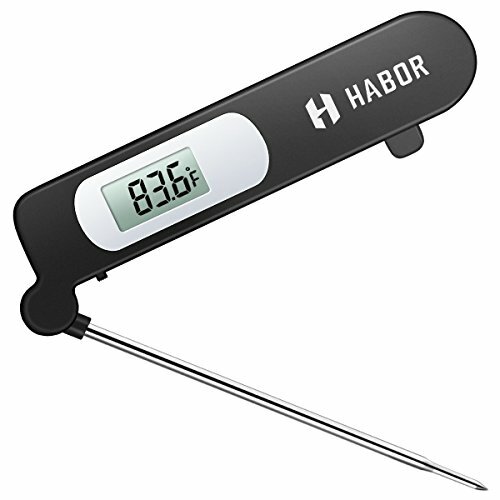 The Harbor Food Thermometer has a 4.8-inch probe that can be extended to 10.3 inches. With a temperature range of -58 degrees Fahrenheit to 572 degrees Fahrenheit, this thermometer is accurate to within 2 degrees and captures readings within 5 seconds. 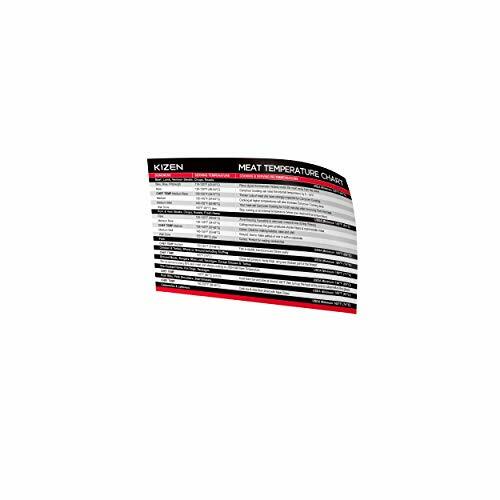 A printed temperature guide on the back serves as an easy reference for cooking meats to optimal heat. This thermometer has an easy-to-read LCD display and comes in 2 color options. This thermometer comes with an 18-month warranty. 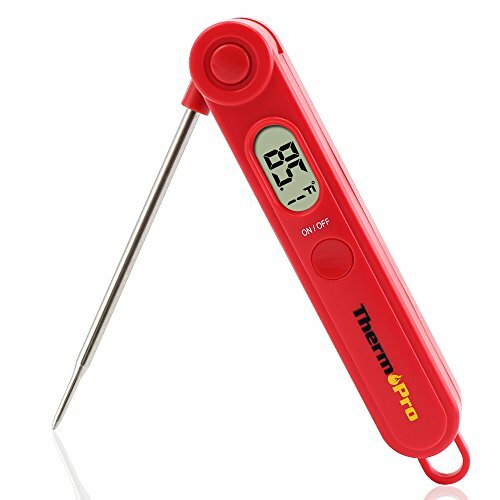 The ThermoPro TP-08S thermometer comes with an 8.5-inch kitchen probe made of food-grade stainless steel and a 3-inch oven/BBQ probe. 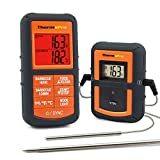 This thermometer can monitor both the temperature of meat and the temperature of the overall BBQ from up to 300 feet away, and sounds an alarm if the BBQ temperatures fall out of your desired range. This thermometer has a temperature range of 32 degrees Fahrenheit to 562 degrees Fahrenheit. Other features include a built-in timer and an LCD display. This thermometer comes with a one-year warranty. 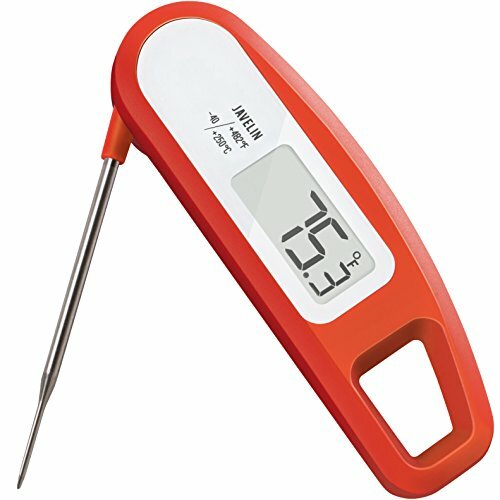 The Lavatools PT12 Javelin Digital Instant Read thermometer has a retractable 2.75-inch probe and reads temperatures within 4 seconds. This thermometer has a temperature range of -40 degrees Fahrenheit to 482 degrees Fahrenheit and is accurate to within one degree. A large 1.4-inch display screen is easy to read. Other features include an auto-sleep mode, a built-in magnet, and a hole for a lanyard. The ThermoPro TP031 Digital Instant Read Meat Thermometer has a foldable 3.8-inch stainless steel probe and can take temperature readings within 7 seconds. This thermometer has a temperature range of -58 degrees Fahrenheit to 572 degrees Fahrenheit and is accurate to within one degree. It can read temperatures in either Fahrenheit or Celsius. Additional features include an LCD display, automatic shut-off, and a built-in kitchen hook for easy storage. The ThermoPro TP-17 Dual Probe thermometer and the Lavatools Javelin Pro Duo Ambidextrous thermometer are two of the best meat thermometers. The ThermoPro TP-17 balances modest cost with exceptional features that include two stainless steel probes, a backlit LCD display, and preset USDA temperatures, which makes it easy to ensure meats are cooked to optimal heat levels. The Lavatools Javelin Pro, although more expensive, also offers advanced features including a backlit, anti-fog display and a stabilization function that alerts the home cook when the temperature reading is available.